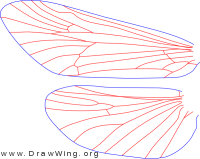 Wings of Apatania zonella redrawn from Schmid (1980, fig. 286) . Wings of Ceraclea annulicornis redrawn from Schmid (1980, fig. 660) . Wings of Brachycentrus numerosus redrawn from Schmid (1980, fig. 605) . 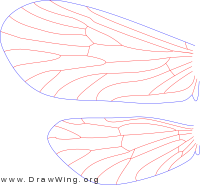 Wings of Wormaldia gabriella redrawn from Schmid (1980, fig.98) . Wings of female of Micrasema rusticum redrawn from Schmid (fig. 620). Wings of male of Neophylax concinnus redrawn from Schmid (fig. 292). Wings of male of Nectopsyche exquisita redrawn from Schmid (fig. 704). Wings of Allomyia bifosa redrawn from Schmid (fig. 245). 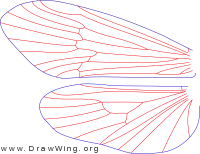 Fore wing of Agapetus hessi redrawn from Schmid (fig. 19). Fore wing of Cryptochia pilosa redrawn from Schmid (fig. 252).